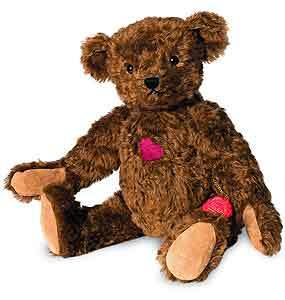 Teddy Hermann Roger Teddy Bear, fully jointed and made of the finest brown Mohair. Limited edition of only 100 pieces worldwide. Product details: Safety eyes, synthetic filling material, Handmade in Mohair wool, so surface washable only, with Growler, Size 39cm tall.